I'm Kaidia, a media professional living in Pittsburgh. I'm a writer, researcher, producer, and creative strategist. Check out my personal portfolio site to learn more about my work! Here's a preview - click here for a closer look! I created this series of data visualizations for a graduate-level course titled "Data Rules: How Quantification Shapes Science, Selves, and States." I'm very excited to have had the opportunity to combine my passion for hockey with my burgeoning interest in data visualization and graphic design. 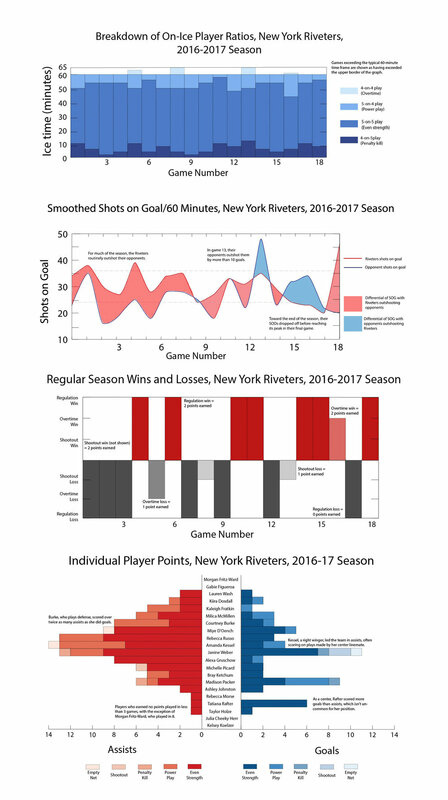 Click here to take a closer look at how I charted several aspects of the Riveters' second in the NWHL, including their wins and losses as well as individual players' goals and assists. I've added some helpful annotations to help convey the design choices I've made as well as how these charts can be read and interpreted by anyone from data rookies to the most passionate of fans. My goal is to produce an accompanying set of graphics for each NWHL team, so watch this space! I'm very grateful to Micah Blake McCurdy (@ineffectivemath) and his website HockeyViz.com for the aesthetic inspiration, as well as Mike Murphy (@DigDeepBSB) and the NWHL's stats pages for the data. For my undergraduate thesis, I created a project that is composed of two methodologically distinct segments placed in dialogue with each other. The first portion, linked above, consists of a traditional written document in which I investigative the development of women’s hockey. To begin, I organize a timeline of historical events that have influenced the growth of the sport. This transitions to a case study of the National Women’s Hockey League, a new salary-granting North American women’s league, and some of its star players. I propose that these particular athletes represent how women’s hockey has succeeded in engaging untapped audiences and by embracing the diverse identities of its stars. To conclude, I predict what women’s hockey may look like in coming decades as its global impact expands. This portion is accompanied by an interactive digital timeline that visualizes the chronology of women’s hockey, which can be viewed below. The second portion consists of a creative visualization of a portfolio of materials that could be used produce a documentary about the NWHL. It consists of a one-sheet outlining the concept and goals, a line-item budget, and a short video trailer (shown below) that I have produced and edited. Additionally, it is accompanied by a process document in which I reflect on my creative process and identify my next steps in moving forward as a producer. Working within a group of four graduate students in a web theory course, I helped present a static proposal for an aesthetic and organizational redesign of LGBT history website OutHistory.org, whose founder consulted on our projects. This project, completed for a graduate-level web theory course, presents a static concept of an interactive timeline detailing the history of significant children's books with LGBT themes. This proposal, completed with two classmates as the final project for an entertainment fundraising course, seeks to present a production plan and solicit production funds for a fictional documentary and women's hockey based on my earlier senior thesis.